East Village resident Tessa Lena is reportedly suing the Whole Foods Market® Bowery outpost and its security firm after a company guard allegedly accused her of shoplifting and hitting her in the chest. 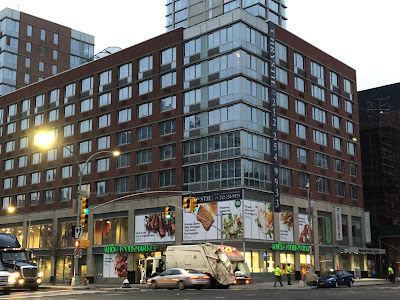 As the Daily News first reported, Lena is seeking $10 million in damages from Whole Foods, Elite Security Personnel and the unidentified assailant. The story begins in April 2017 at the grocery on Houston and the Bowery, when the security guard allegedly tackled Lena without any warning and then accused her of stealing a drink that she had purchased elsewhere. Lena claims in her lawsuit that because the woman didn’t identify herself as a guard and wasn’t wearing any clothes identifying her as one, she had no idea the woman worked for the store. Lena says she paid for everything she left the store with, but that the woman followed her out and at first implied Lena had gone for the five-finger discount. After a manager intervened, Lena was eventually cleared to leave. She avoided the store for months before venturing back in this past August, when she saw the security guard on duty. That didn't go over well with the guard. Once outside, fists flew, and a manager intervened again, admonishing the guard, she said. The Daily News post includes the video clip. Lena has been shopping more often at Trader Joe's now, the News noted. Just want to drop in to point out, as someone who's sued the NYPD for damages, that the $10 million figure is just to get their attention. Nobody expects her to get that much; it's just a standard legal ploy. Let me see, I go into a store months after and incident with a person who I later discover is an employee but now I'm looking for an apology (fight) and when I get what I want I decided to sue the company. I hope this case is tossed out faster than retuned turkeys. So Whole Foods has disheveled looking undercover security guards in order to blend in with their equally disheveled looking customers? There’s a good SNL skit in here somewhere. My sister works at a Whole Foods, the horror stories she tells me should be told around camp fires. Customers bring back half eaten food for full discounts, complain about "crushed lettuce" and the saddest thing that the general public does not know ALL returned food including canned goods is immediately thrown into the garbage. The plaintiff alleges being hit in the chest and tackled out of nowhere for no justifiable reason. So she feels violated and angry for having been assaulted and battered. This is an ideal point to hire an attorney. It is terrible what happened to her, and a guard really has to be careful to not accuse (much less physically attack) someone of stealing unless she actually sees them actually stealing. The plaintiff's biggest challenge would seem to be that she was looking for a fight when she decided to go back to the store, then confronting the store guard and getting in a physical altercation even though the guard told her to leave the premises. All for the jury as finder of fact will need to figure out. Thank you for sharing my story. I have to add that I am friends with many regular employees at that store (the one on Houston). They have nothing to do with what the security guard did. In fact, they are the reason I even came back to the store after the first incident when she tackled me (out of the blue, with no warning). And I did contact the regional office. I emailed them twice, and heard crickets in response. The first time, I decided to let it go. Furthermore, I have never sued anybody in my life. I wasn't born in America, I don't relate to the culture of suing for no reason, and I have had several situations in my life where any American-born person would sue — and I chose not to. Including the first time she attacked me. But when it happens twice? There are many very good people who work at the store. The manager helping me after the second incident acted like a decent human being. Both he and the security manager called me to apologize! So there is a definite distinction between the good people working at the store, and the situation with their security and militarization of the shopping experience. I have seen this video. I would not let that "security guard" watch my dog. She was totally out of line! And void of any training it seems to me.. Isn't there something more important in your life to focus on? Really, you went back to the store after months and confronted the guard? If this ever goes to trial I hope I'm on the jury. After the first time she assaulted me (if you were there, you would be appalled by what happened... it was insane), I was shocked and tried to resolve it with the regional office, but they plainly ignored me. I tried again, and then still ignored me like it’s perfectly normal to tackle unsuspecting shoppers without a warning. The only reason I did not sue the first time was because I was spineless and an idiot. Everybody was telling me I should. I was not born in America, I am a musician, I like music, and I hate lawsuits. So I didn’t listen to people and didn’t sue. I have never sued anyone in my life even when I was majorly wronged by entities with money). So I was going to boycott the store but I am friends with many employees there and I didn't want to sacrifice the joy of talking to the people who I like and who are nice to me. I love them, we always talk like family whenever I am at that store. So I started going back as a customer (I certainly didn't expect to see that security guard there again — and for a while, I didn't). And then on that day I saw her again. It really got to me. We are talking somebody who physically tackled me out of the blue without any warning, accused me of shoplifting (I have been a regular at that store fore YEARS and have never stolen anything anywhere in my life!!!) and degraded me like a sadist while refusing to even tell me her name. It was a total power game and abuse. I think if you saw what happened, you would totally be on my side. It was so unfair. And to the credit of the store manager, after she punched me in front of him this past August, he acted like a decent human being and was very supportive. Both him and the security manager called me to check on me. And so many store employees told me they were sorry it happened to me!! And then as I was still trying to get justice without a lawsuit, the security firm was trying to again humiliate me and shut me up. I then did research and found that I am not the only one in this situation. There was a recent case at the Union Square store very similar to mine where a security guard assaulted a shopper without any reason, and other cases as well that are as insane. So this is about more than me. It is my first time in life standing up for myself like this, I really wish I didn’t have to. I had to really collect all my courage to do that. My word ! I expect this kind of behavior at Dennys ! Clutches Pearls, retrieves monocle from tea cup. To those who scoff at the idea of anyone confronting another person who has perhaps wronged them, try to see it with other than an American attitude of being confrontational with everyone and relying on authorities to resolve disputes - guess what, lots of people believe in instigating DIALOGUE with their fellow citizens, and as I have known Tessa Lena for a while I know it is completely in her character to try and connect rather than be divisive. Tessa is brave, truthful and kind. Note she did NOT seek litigation immediately, but sought some sort of expansion on the underlying conflict, "closure", if you will. Tessa is an exceptional person, y'all don't know her and I'm sad that so many of you are so cynical and damaged that you would doubt a person could remain civic-minded and humane even after being attacked. Don't listen to them Tessa, keep following your path, we're rooting for you!